UU A Way Of Life: Is it time to listen to the wise ones? The perception in our society of Unitarian Universalism is that anything goes. There is no creed and UUs accept anyone and require very little of anyone stating that "to each his own" is the way to go. The UU fourth principle is that we covenant together to affirm and promote the free and responsible search for truth and meaning. The critical word in this principle is, or course, "responsible." We live in a culture which is radically subjective and relativistic. It has given up any belief in an objective morality. It believes that anything goes in certain situations, for certain people, at certain times. In the postmodern world, every thought, every belief, every value, every preference is a social construction. Conscience, justice, goodness, truth, beauty have become things of the past that exist in the realm of nostalgia and sentimentality. Where are the smart people? Where are the wise ones? Does nobody stand for anything anymore? Is there nothing that I can use as my compass, my navigational north star? 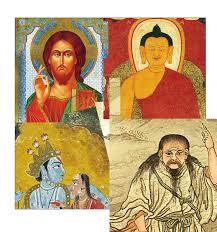 Into this moral morass, this moral swamp, comes Jesus, Buddha, Lao Tzu. However, these enlightened people shared an understanding of reality that the common human, who is asleep in social conditioning, cannot apprehend let along understand and apply in their lives. What then is to be done to improve the human condition? Psychotherapy is needed at a societal level. The purpose of this societal psychotherapy is to remove the blocks and obstacles to truth. This removal of the blocks and obstacles to truth is the removal of fear. As Franklin Delano Roosevelt said which he is believed to have gotten from Henry David Thoreau, the biggest fear is fearing fear itself. The biggest problem humans experience at a personal and societal level is fear. Fear prevents them from loving which is the path to peace, joy, and comfort. The tool to eradicate fear is forgiveness. Until we can rise above the dramas on the path of the ego we will continue to experience turmoil and distress. Forgiveness requires a shift in perception and belief from the path of the ego onto the path of the spirit. The means of this shifting is what Jesus, Buddha, and Lao Tzu attempted to teach their fellow human beings. However, because of their fear and willfulness most people do no have the ears to hear, nor the eyes to see, nor the minds to comprehend the suggestions that the great ones offered humanity. We are coming to a time of listening and awakening. It is here, now, and requires each of us to pay attention, reflect, understand, and apply the wisdom offered to us. Rising above the drama, sensationalism, and entertainment of the ego to embark on a new path of love, compassion, generosity, and charity is the means to the path forward in our human evolution.